When we woke this morning we could see some dark clouds on the horizon and our neighbours said they saw on the Elders weather site that Yulara (Ukuru) had just had 45ml and it was heading our way. So we knew we wouldn't be getting up to to much outdoorsy stuff. But we got to lunchtime and the rain still hadn't arrived so we decided to go for a drive out to the West MacDonnell National Park. 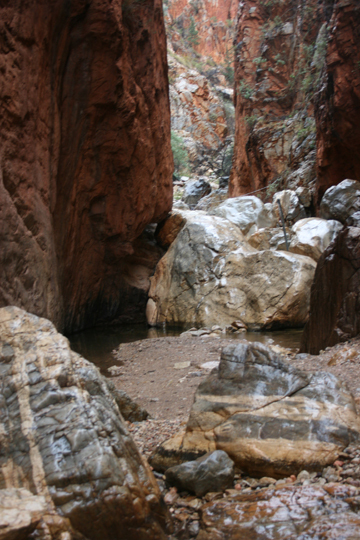 I really wanted to do a walk to Standley Chasm, but the girl in the Information Centre said it was a 2.5hr return walk and I wasn't sure how I would go. Wouldn't you know when we arrived at the cafe at Standley Chasm so did the rain, but the great thing was the info centre girl was wrong and it was only a 40min return walk. I really wanted to do it but the rain was putting me off a bit. After sitting for about 10mins I decided I didn't care if I got wet I was going to do my walk. I am so glad I did, the rain was only drips on most of the walk and the magnificence of Standley Chasm was breathtaking. 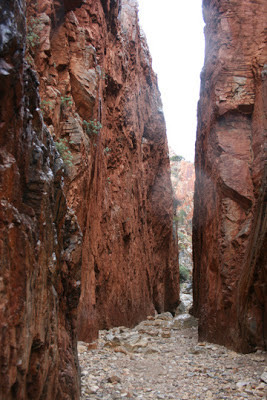 While standing in the Chasm all alone I really felt the spirituality of the area. 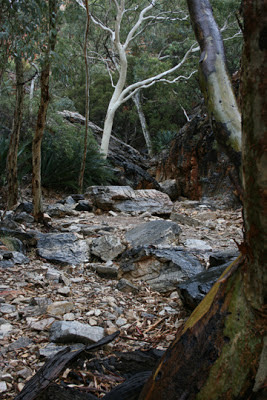 It was a pretty flat walk but there were lots of rocks that were slippery and a bit shaky - but once again I did it. Once again I am so proud of myself. Might I add by the time I got back to the car I was absolutely drenched but happy!! Speaking of paths.....this looks like a good and rewarding one to have taken Davine. All the rock along the way. The other day I took a different path/trail at the park, a little hesitant at first but glad I did. I agree, what's a little rain anyway!? This is one of the most Spiritual places I have ever been. Loved my time there. I love that you walked in the rain.